Where there's smoke, there's me. The hotter things get, the better he likes it, and this goes for fires AND fights! 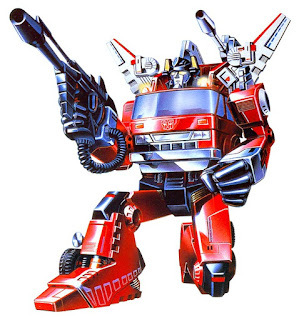 Inferno can do anything Earth fire trucks can in vehicular mode, but is often distracted from his job to engage in combat. His great strength is thanks to his ceramic-plated armored skin that can withstand 8000 degrees Celsius. He also has an extinguisher rifle that shoots flame-suppressing foam, an energy dampening beam to counter other beams and forearms that shoot missiles. Unfortunately, he doesn't follow orders well and isn't very mobile as a robot.